Octavia Noir Tobacco Shaving Soap has Honey tobacco, black tea, hint of fruit and heady spices. It is a tallow wet shave soap in a jar for the best in a shaving experience. Octavia Noir Tobacco Shaving Soap has Honey tobacco, real tobacco absolute, black tea, fruit and unique spices. The scent is rich, deep and refined. It is a masculine scent that the ladies love to smell. My inspiration came from a well known steam punk movie. This is what a well dressed, classy man would use for his wet shaving pleasure. If you enjoy quality pipe tobacco type scents, you will love Octavia Noir. This wet shave tallow soap captures the very essence of what a quality tobacco should smell like. 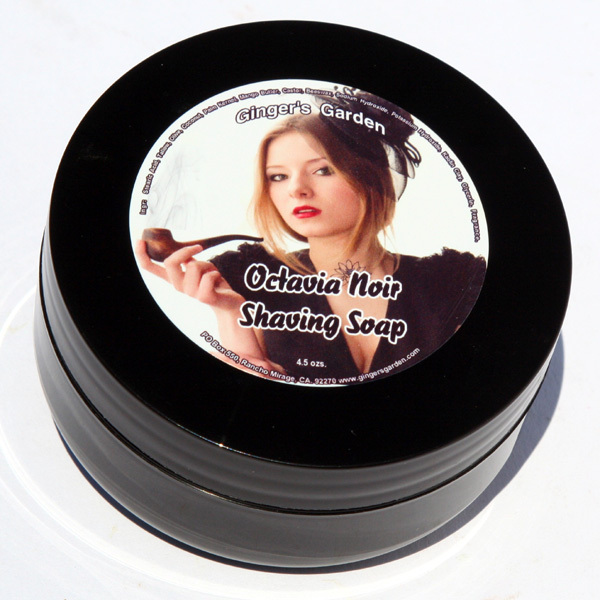 Octavia Noir is a thirsty shave soap. Bloom the soap by adding a small amount of warm water on top of the shaving soap. Blooming helps to soften the soap, the scent comes through better and it is easier to lather. Soak your shaving brush in hot water, then shake off the excess. Swirl the shave brush on the top of the soap til you start getting a good creamy lather. Apply the lather to your face using your shaving brush in nice long strokes. If you use a scuttle or a bowl, swirl the soap in the bowl til you see thick and creamy lather. Then apply to your face. I formulated this tallow shaving soap for thick creamy lather that lasts, gives you a cushion to help prevent nicks and cuts and leaves your skin nourished and silky smooth. If you would like an aftershave to match, choose the after shave listing, then type in Octavia Noir in the comments section when you check out. Ingr: Stearic Acid, Tallow, Olive, Coconut, Palm Kernel, Mango Butter, Sodium Hydroxide, Potassium Hydroxide, Castor, Beeswax, Essential Oil Blend, fragrance.